We may be old but still no wrinkles. You can trust your investment with us. When a company gets big they try to convince you that they deliver the personal attention of a small business. 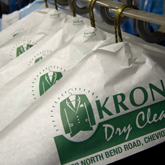 At Kroner Dry Cleaners, personalized care and attention is the way we’ve done business since 1939. Under the direction of Ray Kroner, our staff understands that your garments are a reflection of who you are and that no detail is too small for the individual care and attention your investment deserves. We understand that when our name goes on the bag that our reputation—and yours—is at stake. You can trust your investment with us. At Kroner Dry Cleaners we hold onto the little details, like sewing on loose buttons and mending seams, as well as big concerns such as using state-of-art earth friendly technology. In an ever-changing world, we know that hands-on-care will never go out of style and want you to look your best on a healthy planet. The company’s physical location is at 3820 North Bend Road, however residential and corporate pick up and delivery service allows the Kroner company to touch much of Greater Cincinnati. Our attention to detail will make you look your best. We know your wardrobe is an extension of your personality and will handle your garments with the greatest of care.